A serious paper, despite the odd title. In short, curious researchers decide to do a series of in-depth interviews to determine if employers are making rational decisions about who they should hire. In results surprising very few, people discriminate, but don’t do so as the result of updating based on experiences. Nice figure of speech ya got there. It’d be a shame if we were to…test it. I don’t think anyone is surprised that there’s memory distortion in people who think they’ve been abducted by aliens, but did you know that there’s some overarching characteristics in domains unrelated to green men? Still curious: are there predictive characteristics beforehand? Some social psychologist gets annoyed at the publication of Bem’s precognition research, writes snark, gets it published in the same journal that published the ESP research. Also, uses charts like the one found in this post’s heading. Sterling (1959) first documented psychologists’ remarkable precognitive capacities. 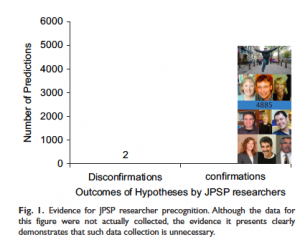 He showed that 97% of articles across a random selection of psychology journals reported positive results. Further, Fanelli (2012) showed that psychologists have kept up this impressive prediction rate through the present. Moreover, his evidence suggests that psychologists have more positive results than virtually every other scientific discipline. For example, biologists have excellent precognition but still not as good as psychologists (Fanelli, in press), political scientists appear to be guessing randomly (Tetlock, 2005), and economists are wrong about virtually everything (see Economics, all of it). Psychology is number one! The evidence for precognition is psychological science itself. Just open a random issue of any psychology journal. In it, you will find dozens of a priori hypotheses anticipating findings that eventually occurred. 1) Psi researchers aren’t above self-satire either. Charlie Tart, prof. emeritus at U.C.Davis, occasionally poked fun at his own psi research during speaking engagements. One occasion, he said “who needs telepathy when we have this?” and pulled out an oldschool telephone receiver, and “who needs PK when we have this?” and pulled out a TV remote control. The only additional claim needed for precognition is that retrocausal input can affect human brains. If anything, the contrary claim that brains are somehow above influence by other physical forces, is a supernatural claim. b) Those such as Sam Harris who are hard determinists, need not even invoke nonlocality, as they can stick with a classical computing model of the brain as an explanation. In fact, hard determinists should welcome findings on precognition, and consider them as support for their own position! 3) What’s good for the parapsychological goose is also good for the social sciences gander, and all the little goslings too: if you applied the same standards of skepticism to the entire range of social sciences research, little to nothing would remain standing. Instead, the double standard is so obvious that it makes “skeptics” look like ideologues with an axe to grind, and does a major disservice to skepticism as such. When “skeptics” call for Bayesian priors of a trillion to one against psi, they come across as blatant obscurantists. Meanwhile, much shoddy dreck gets published in the social sciences journals and goes unquestioned. 4) When atheists and agnostics promote the idea that psi is “supernatural,” we set ourselves up for a fall. The blunt fact is that a majority of the population reports having psi experiences at one time or another in their lives. It doesn’t matter whether those experiences would stand up to any kind of scrutiny: if our reply is “that’s supernatural and it can’t exist,” then we push those people right into the hands of religions both conventional and new-age. If instead our reply is “that’s normal, it’s a low-level brain activity,” we preserve the rational paradigm and prevent people falling into supernaturalist nonsense and overt woo. 5) Conversely, one of the best things for rationalism would be to find the physical mechanism for psi and demonstrate it in a clump of neurons in a proverbial petri dish. “Look, we can do this with isolated nerve cells: no gods, ghosts, or goblins needed!” This would liberate the majority of people who have psi experiences, from having any reason to assume those experiences have supernatural causes, and thereby keep them out of the clutches of those who capitalize on supernatural explanations.